In retrospect, it makes sense that the story of Raymond and Patsy Nasher would begin that way, with a vision that no one else could see. As neophyte collectors, they anticipated the value of modern sculpture in a market that overwhelmingly preferred paintings. During the sixties, seventies and eighties, while they were assembling the greatest collection of modern sculpture in private hands, they discovered a unique way to share it with a vast audience at a time when public art was barely being discussed. 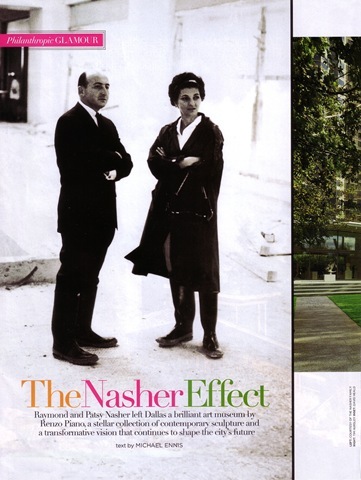 And today the enduring legacy of their vision is a one-of-a-kind institution, the Nasher Sculpture Center in Dallas. The stunning Renzo Piano-designed center, the crown jewel of Dallas’s burgeoning Arts District, is celebrating its fifth anniversary two decades after Patsy’s untimely death, and a year after Ray’s passing, with the exhibition The Story of the Nasher Collection: A Tribute to Raymond and Patsy Nasher. The Nashers never set out to be remembered with the civic reverence and gratitude they’re accorded today. To an extraordinary extent, they simply followed their passions, guided by their devotion to art, community and each other. Born in Boston in 1921, the son of a Russian immigrant garment-maker, Ray understood the transforming effect of art. “My parents didn’t have the opportunity for an education in the arts,” he said, “so they were determined that their only child would know something about what was happening in the world.” His parents took him to art museums at least once a month. Ray’s life as a collector didn’t begin until he began his life with Patsy, whom he married in 1950. The couple moved to Dallas in 195 1; Ray presciently foresaw the Sunbelt’s postwar boom and built housing for World War II veterans. The newlyweds had vowed that when they had money, they would buy art. During the fifties they vacationed in Mexico, where they discovered pre-Columbian artifacts were an affordable bargain. In 1980 the Nashers left a major bequest of Guatemalan textiles to the Dallas Museum of Art. Ray’s breakthrough project was NorthPark Center, a Dallas shopping mall that opened in 1965. NorthPark featured a clean-lined architectural scheme with uniform graphics for all the stores. Particular attention was paid to the spacious courtyards, which allowed shoppers to linger amid fountains, a pond, plantings and works of art. 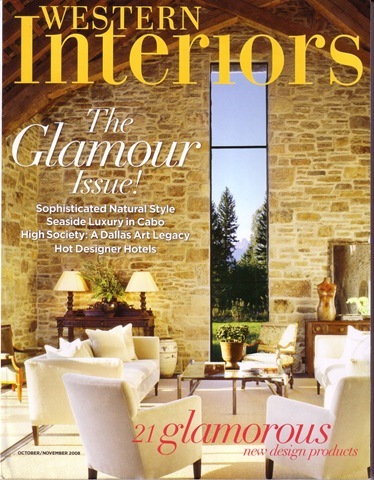 Neiman Marcus became an anchor tenant, and high-end American retailing has never been the same. 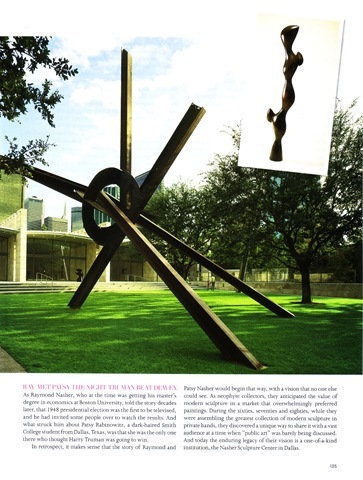 The cornerstone of the present-day Nasher collection was laid two years after NorthPark opened, when Pasty splurged on a present for Ray’s forty-sixth birthday: Jean Arp’s 1961 bronze figure Torso with Buds, purchased at the Sidney Janis Gallery in New York. That birthday gift launched Ray and Patsy on one of the twentieth century’s most remarkable collecting adventures. The couple focused on sculpture, and they began with classic modern works by Henry Moore, Alberto Giacometti, Joan Miró, Alexander Calder and Barbara Hepworth. They soon progressed to more “gutsy” works, as Patsy put it. Claes Oldenburg came to Dallas to install his Typewriter Eraser, and she took him to his first rodeo; and she was among the first to appreciate the work of Jeff Koons, acquiring his stainless-steel bust Louis XIV, 1986, in 1988. “Ray and I are by art possessed,” Patsy famously said. The Nashers’ relatively modest mid-century-modern Dallas house designed by local Frank Lloyd Wright disciple Howard Meyer—was filled with modern sculpture, as were the park-like grounds. The couple established personal relationships with many of the artists whose work they collected. Henry Moore, who exchanged visits with the Nashers, based one of his sculptures on an Oceanic piece he saw at the Nashers’ house. Andy Warhol and Patsy found they shared a kindred acquisitive curiosity, and she traded him ethnog raphic artworks for portraits of herself and her three daughters. By the mid-eighties, the art world had begun to notice that this dynamic Dallas couple was assembling an unprecedented priv ate collection. In 1987 the Dallas Museum of Art mounted an exhibit that went on to the National Gallery of Art in Washington, D.C., then to Madrid, Florence and Tel Aviv. Yet perhaps the most remarkable aspect of this newly anointed superstar collection was that Patsy had built much of it while struggling with a deadly illness. She willed herself to attend the openings, finally succumbing to cancer on the eve of the Florence premiere in 1988. Ray took up the curatorial functions Patsy had assumed. He filled gaps in the collection with seminal works like the plaster for Auguste Rodin’s The Age of Bronze, while some of the world’s most prestigious museums maneuvered to secure the inevitable bequest. The decade-long courtship of the Nasher collect ion became something of an art-world soap opera. Among the most ardent suitors were National Gallery of Art director J. Carter Brown and the Guggenheim Museum’s Thomas Krens, whose 1997 exhibition of the Nasher collection was, at the time, the most popular in its history. “Patsy Nasher is here today in this room with us,” said Ray when he stunned the art world in 1997 and announced he was going to put up $30 million of his own money (a figure that would more than double) to build the Nasher Sculpture Center. His decision involved more than preserving the integrity of the collection that he and Patsy had built. He envisioned a global arts destination that would recharge the dorm ant downtown Dallas Arts District. Ray Nasher and Renzo Piano shared an interest in urban planning, and Nasher was unafraid to push his celebrated collaborator out of his comfort zone; the result is a masterpiece that has earned worldwide acclaim. Piano called the center a noble ruin because the Italian travertine walls and broad expanses of glass suggest an archaeological site wrapped in a high-tech envelope. But the effect is anything but antiquated. The center has a daring transparency, inviting passersby to look straight through the galleries and into the sculpture garden, where rows of live oak trees and cedar elms create outdoor rooms for works like Richard Serra’s sinuous 100,000-pound behemoth My Curves Are Not Mud. Raymond Nasher often intimated that he intended his sculpt ure center to lead the Arts District into the future, and his wish will come closer to reality next year, when Norman Foster’s opera house and a Rem Koolhaas theater open just up the street. The transformation of the Arts District along the lines Ray envisioned—as well as the transformation of Dallas because of it— has only begun. When Ray met Patsy on that election night sixty years ago, two gifted people began to see as one—a vision so passionate and far-reaching that we have yet to see the end of it.